Dilated cardiomyopathy (DCM) is an idiopathic condition that results from impaired ventricular systolic function, leading to progressive cardiac remodeling and dilatation. A reversible form of DCM can develop due to alcohol use, pregnancy, chronic uncontrolled tachycardia, hypothyroidism, hyperthyroidism, drug use, and other endocrine dysfunctions. , We report a case of 40-year-old female patient with DCM with primary hypothyroidism. 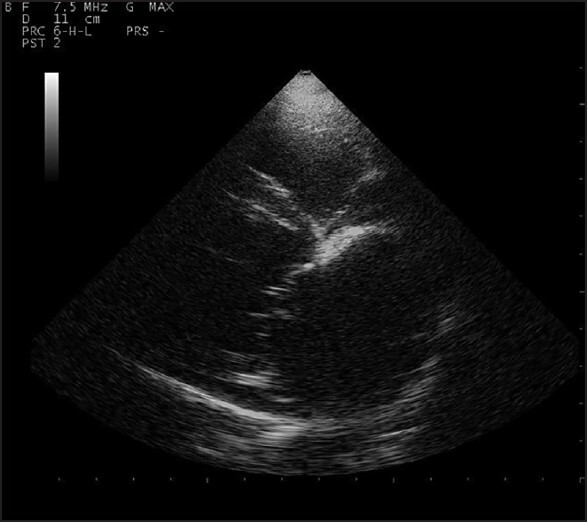 A 40-year-old female presented with history of progressive dyspnea for the past 1 year. She also had swelling of both lower limbs for the past 1 year. There was no history of fever, joint pains, chest pain, cough, loss of weight, or loss of appetite. She was admitted to hospital with these complaints. Her blood pressure was 110/70 mm Hg, pulse 88/min. Her apex beat was in sixth intercostal space in anterior axillary line. S1 and S2 were normal; left ventricular S3 was present. There was no murmur. There was no hepatomegaly. Her routine blood investigations including complete blood count, liver function test, and renal function test were normal. Her chest X-ray showed cardiomegaly [Figure 1], electrocardiography (ECG) showed low voltage, and 2D echocardiography showed DCM, moderate mitral regurgitation (MR), mild tricuspid regurgitation (TR), and ejection fraction (EF) of 15% [Figure 2]. There was no pericardial effusion. She was diagnosed as a case of DCM based on ECG, chest radiograph, and echocardiography. She was put on digoxin, angiotensin converting enzyme inhibitor (ACE I), and diuretics. Patient had mild relief after the aforementioned treatment. She was further advised thyroid function tests (TFT). She had severe hypothyroidism with thyroid-stimulating hormone (TSH) >100 mU/l. She was started on tablet thyroxine 25 μg/day in addition to the therapy she was receiving for DCM, which was increased to 50 μg/day after 2 weeks. She started having symptomatic improvement. TFT repeated after 3 months still showed evidence of hypothyroidism and dose of thyroxine was increased to 100 μg/day. Repeat echo done after 6 months showed EF of 40%. Her digoxin and diuretics were omitted, and she was continued on ACE I. Subsequently, TFT and EF were normal on repeated testing. Now, she is off all drugs except thyroxine for the past 1 year, and she is well controlled on thyroxine 100 μg/day and is symptom free. Most consistent cardiac abnormality recognized in patients with overt hypothyroidism is impairment of left ventricular (LV) diastolic function, which is characterized by slowed myocardial relaxation and impaired early ventricular filling. LV systolic function is only marginally subnormal. In conclusion, the present report and the previous ones should alert the clinician to consider hypothyroidism also as one of the possible causes of DCM. 1. Kantharia BK, Richards HB, Battaghia J. Reversible dilated cardiomyopathy: An unusual case of thyrotoxicosis. Am Heart J 1995;129:1030-2. 2. Khochtali I, Hamza N, Harzallah O, Hamdi S, Saad J, Golli M, et al. Reversible dilated cardiomyopathy caused by hypothyroidism. Int Arch Med 2011;4:20. 3. 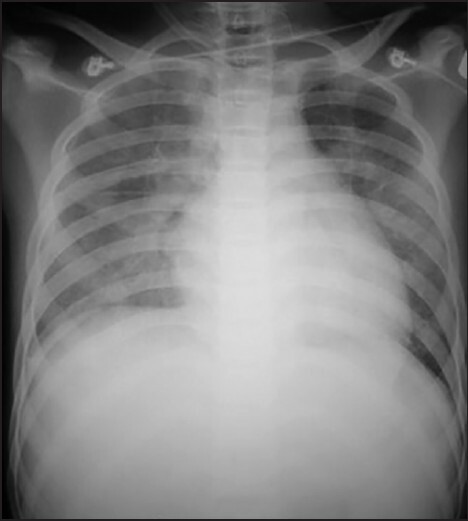 Derish M, Eckert K, Chin C. Reversible cardiomyopathy in a child with Addison's disease. Int Care Med 1996;22:460-3. 4. Danaher PJ, Cao MK, Anstead GM, Dolan MJ, DeWitt CC. Reversible dilated cardiomyopathy related to amphotericin B therapy. J Antimicrob Chemother 2004;53:115-7. 5. McAllister RM, Delp MD, Loughlin MH. Thyroid status and exercise tolerance. Cardiovascular and metabolic consideration. Sport Med 1995;20:189-98. 6. Ladenson PW, Sherman SI, Baughman KL, Ray PE, Feldman AM. Reversible alterations in myocardial gene expression in a young man with dilated cardiomyopathy and hypothyroidism. Proc Natl Acad Sci U S A 1992;89:5251-5.